Hairong Investments International Pvt Ltd, Sri Lanka, Chairman, Pan Liag and Managing Director Dr Palitha Kohona, presenting the BRICA membership letter to President of NCCSL Sujeeva Samaraweera and Secretary Deepal Nelson. 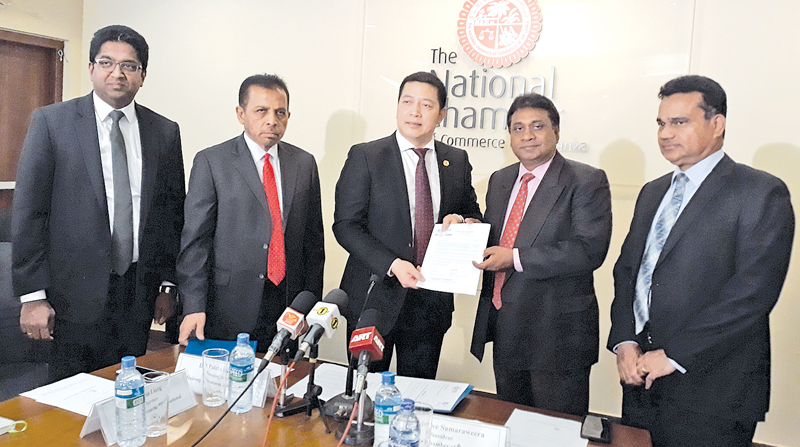 The National Chamber of Commerce of Sri Lanka (NCCSL) has been accepted as a member of the Belt and Road Industrial & Commercial Alliance (BRICA) a powerful organization, promoting business and investment among its 27 member countries. The NCCSL is the only chamber in Sri Lanka which has been accepted as a member of BRICA. With this arrangement thousands of BRICA businesses in other countries will be open to Sri Lankan counterparts. BRICA is a multilateral cooperation body established by the China Federation of Industrial Economics and consists of members from Malaysia, India, Pakistan, Georgia, Iran, Kazakhstan, Mongolia, Turkey, Egypt, Jordan, Belarus, Czech Republic, Latvia, Lithuania, Romania, Russia, Ukraine, Brazil, France, Germany, Netherlands, Denmark, Armenia, Belgium, Finland, Mongolia, Morocco, and now Sri Lanka.